The primary type of credential from the 1919 through 1931 period are celluloid and pin back button. 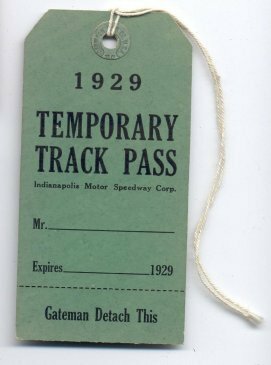 Some celluloids from this period are blank on the back as seen on the 1926 Pitman while others have legal statements as seen on the 1928 Season Track Pass. The Whitehead & Hoag Co. of Newark New Jersey is one *known maker of celluloid credentials as seen on the 1923 Press Race Day Official. It is *uncertain who manufactured the other types of credentials from this period. 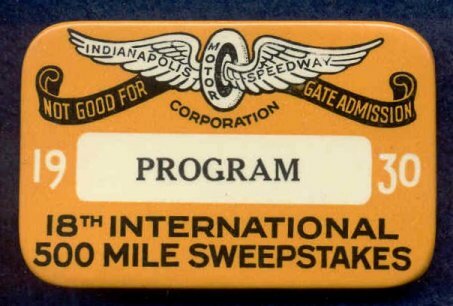 Race day/race day official credentials are generally of the *celluloid or pin back button type while season and temporary track passes are generally *celluloid or thin cardboard. Celluloid "Driver" & "Exclusive Concession" and Usher ribbon. Note that the race is called the "Liberty Sweepstakes". The 1920 Driver, Pitman Mechanic and Press are celluloid while the track pass has a button at the top with a ribbon attached to the celluloid portion. The Pit Paddock credential is of the thin cardboard type as are the 1921 and 1922 Pit Paddock credentials below. All have perforations and have serial numbers at the bottom. Note that the celluloid Press credential has the statement “Women Not Admitted” and the 1921 and 1922 Pit Paddock credentials have “Ladies Not Admitted” at the bottom. Although this statement is on the 1920 celluloid Press credential, it’s missing from the Pit Paddock. Makes one wonder if a woman snuck into the Pit Paddock which prompted the statement to be added to the 1921. All that’s left from the 1921 track pass is the pin back button portion. This is the only year *known where a celluloid pin back type of credential was manufactured. The manufacturer Whitehead & Hoag is represented on the back as "W. & H. Co. Newark N.J." on the back. Note the two Guest race day credentials have a red, white and blue ribbon (the Pitman would've had one as well) while the track pass has a brown string in correlation to the brown Wing & Wheel on the pass. Whether this pattern is the case for all credentials is unknown. 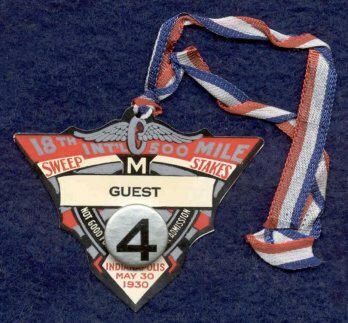 1925 is the earliest known* example of a number button on a Race Day Official Credential. The numbers (which can be on a button or printed on the credential), are believed to designate a floor of the Pagoda. Most are found on "Guest" credentials, but there are examples other types such as the #2 1946 "Pagoda Paddock" being one of them (see 1932-1946 Credentials). The 1927 “Information Ask Me” and the 1929, 1930 and 1931 Ticker Seller pin back buttons below are the *largest credentials known measuring about 4" across. 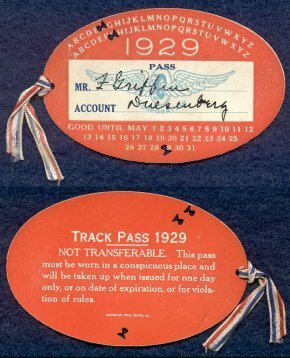 Although not from the ‘500’, the thin cardboard credential from the Hispano-Suiza - Stutz 24 hour race of April 18th, 1928 is similar to the Temporary Track Pass. The different color and number on the Pit pin back buttons below may be to differentiate the *pit box number. Note there is a celluloid and a thin cardboard Track Pass (the same occurs for 1930). It is uncertain why two different types of track passes were issued. Note that there are celluloid and pin back button Race Day credentials below. It is unclear why two different types of this credential were issued. The season track pass is celluloid while the temporary track pass is thin cardboard. Credentials from 1919 through 1931 become easier to find although none can be considered an easy acquisition. The 1929 and 1930 celluloid type are the two most likely to be found. Any credential associated with a race team, such as Pit pin back buttons or Driver celluloid type are generally tougher to come by and more desirable than one designated Press, Concession etc..